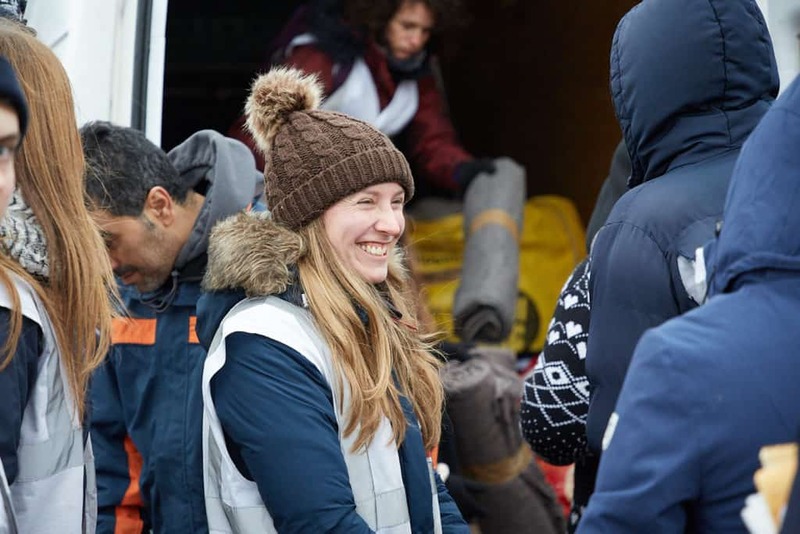 I travelled with my wife Sharon and RA-C colleague Philip Horner who ferried us there and back via the Channel Tunnel and shared much appreciated guidance based on his extensive experience of volunteering in Calais. 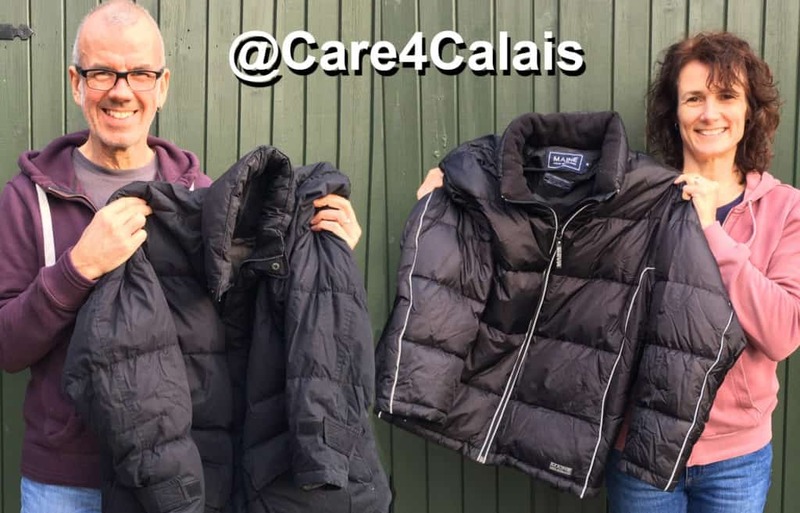 Care4Calais are appealing for donations of much needed winter coats for refugees living outside in all weather and all temperatures, so we identify a couple of coats to donate to the Coats4Calais campaign and set about encouraging others to do the same via Facebook. 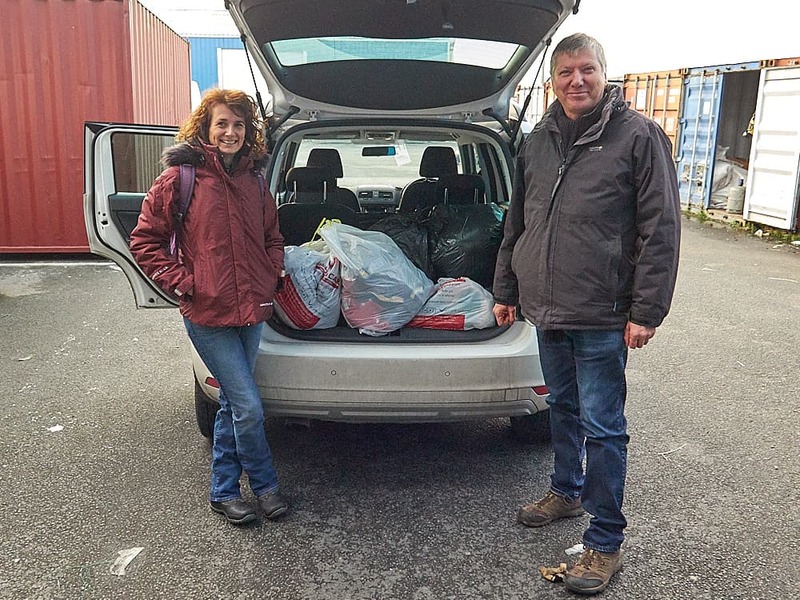 We are very pleased to be able to take five large bags stuffed with donated coats, hats, gloves, scarves and hoodies – the campaign may be for coats but keeping warm requires more than just a warm coat and we’re sure that the donations will be well-received. 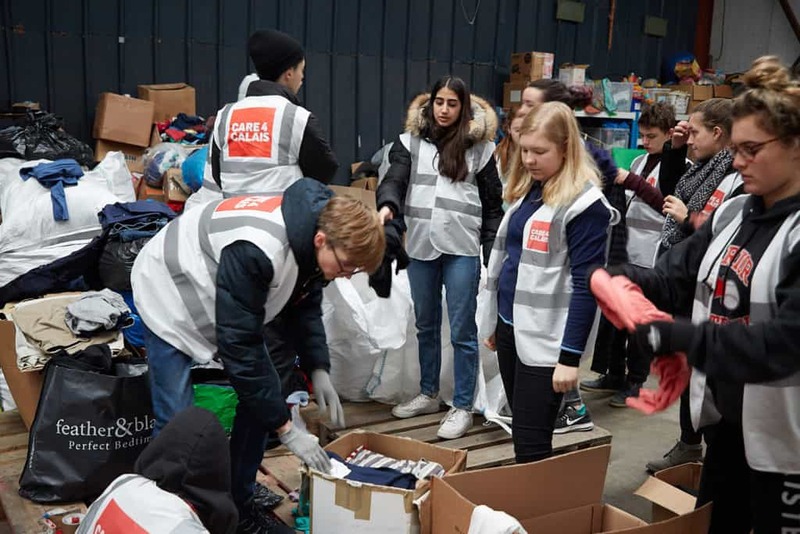 The Coats4Calais campaign is still running, along with Care4Calais’ ongoing appeal for a wider range of items of clothing, toiletries, food and drink that refugees desperately need – more details at the end of this piece. An early start, first time through the Channel Tunnel and we’re in Calais. I’ve been to Calais several times in the past so the skyline looks familiar enough, but the roads are now protected like a fortress, high white fences topped with razor wire seem to be everywhere, illuminated matrix signs warn of objects or persons in the road – I’ve seen Calais on the TV news often enough, but the fortified nature of the roads is still a shock, the ‘enemies’ that this fortress is designed to repel are, of course, the refugees that we’re here to support. 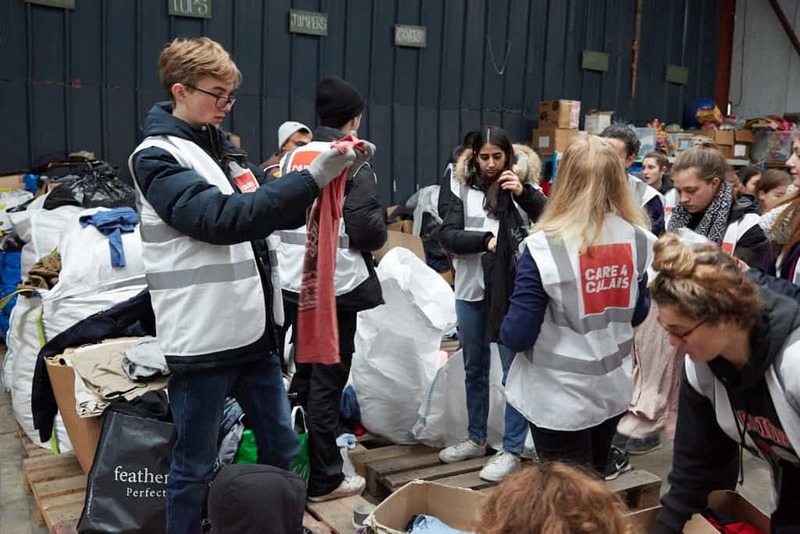 We arrive at the Care4Calais warehouse to find it busy with a veritable army of volunteers, our trip coinciding with a group of around 30 students and teachers from a school in London, plus a number of other independent volunteers. 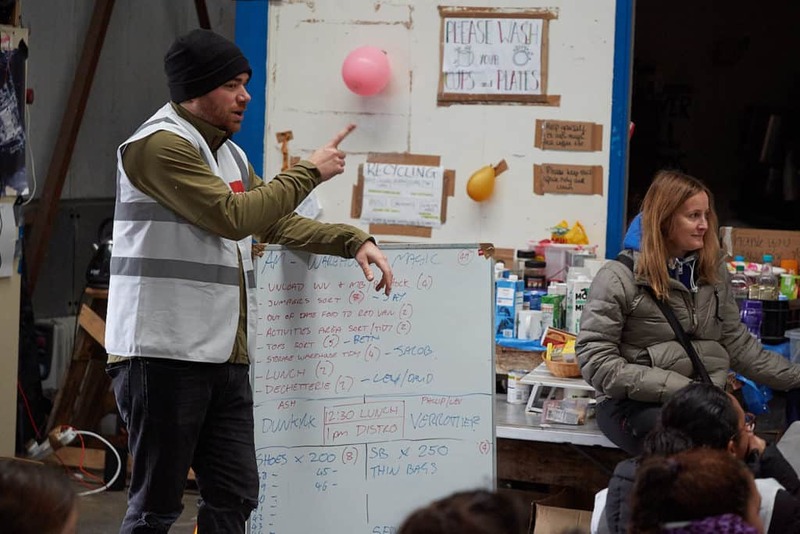 It’s not always like this, indeed when we all leave in three days’ time there are likely to be just two volunteers assisting the core team of four who run the Care4Calais operation in France 365 days a year. 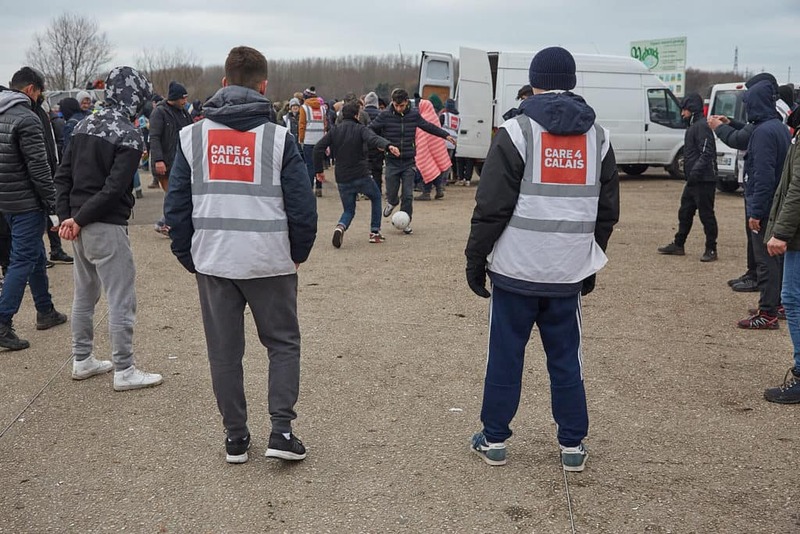 Care4Calais have developed a clear and systematic approach to their work, making great use of the volunteers that they have available to them at any particular time. Mornings are used for warehouse activities, afternoons for the distribution of items of clothing, bedding, food, etc., the provision of refreshments and much needed mobile phone charging, wi-fi internet access and hair-cutting facilities. Plenty of volunteers means that lots of work can be undertaken in the warehouse, sorting donations by type, gender, size, etc. and boxing them into known quantities so they can be easily retrieved when scheduled for distribution. 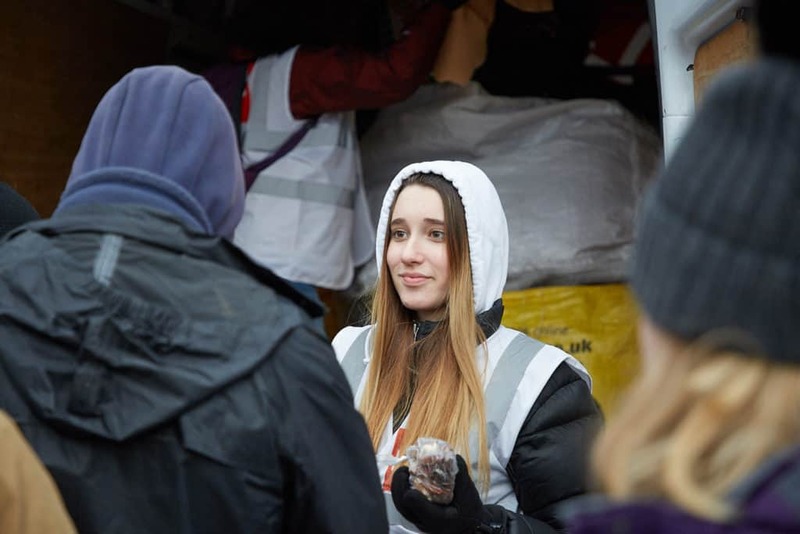 Morning warehouse tasks complete, we eat lunch prepared by fellow volunteers, attend today’s pre-distribution briefing, allocate volunteers to the many different tasks and set off for our first encounter with the people we are here to help. I made it fairly clear that I’d do whatever I was asked to do while in Calais, even so I’m more than a little surprised to be handed the keys to a large and very well-used Transit van! We’re taking two hundred blankets and bags of dried fruit and nuts to Dunkirk, approx. 40 minutes away. Although on unfamiliar roads in a very unfamiliar vehicle, it’s an easy enough trip as I’m following full-time Care4Calais team member Leu in a minibus full of students to a pre-agreed rendezvous point adjacent to a large supermarket and retail park. We arrive at the rendezvous and, while we wait, the rest of the volunteers disembark and walk to the distribution site to establish an orderly queue to help the distribution run as efficiently and fairly as possible. Waiting in my van, I am passed by a number of small groups of people going about their lives – they could be students returning from afternoon classes, or an afternoon shift preparing to clock on at an unseen college or place of employment. I wonder how the refugees that I’m about to meet will be different from these people around me – and then it hits me – these utterly normal looking people aren’t students or employees, they are the refugees that we’re here to help and they are all making their way to the distribution for the things they need to sustain some kind of life in otherwise intolerable circumstances. I was shocked then and I remain shocked now by that moment of realisation. I’ve worked with refugees and asylum seekers in the UK, I know that refugees are normal people just like rest of us and I certainly don’t hold with the demonisation of them as presented by a handful of politicians, so-called ‘commentators’ and some sections of the media – even so I was, and remain, truly shocked by that realisation. The distribution point where those small groups were heading is a parking area situated in a large country park complete with walks, lake and wooded areas. I drive the Transit into the parking area which is already very busy – another charity is already here running their own distribution, Medicins du Monde are dispensing health services, and there are around three hundred refugees, primarily Iraqi Kurdish men of various ages. Sajid Javid’s ‘major incident’, borne out of ignorance or wilful misinformation? In part I visited Calais to document the current situation, in the hope that I’d be able to help raise awareness of the horrendous situation inflicted on these people in ‘our’ name by the UK Government’s refusal to provide a safe and legal route for people to claim asylum in the UK. I don’t understand why the UK appears to have such an apparently negative view of immigration, not least because the benefits afforded by it and the cultural diversity it offers seem to be all around. But I do think it important to recognise that, like so much else that is wrong in the world, the people around Calais desperate to get to the UK are suffering, and some are dying, because of very deliberate political decisions. A day or so before we left for Calais, Home Secretary Sajid Javid stoked the flames of intolerance by declaring a handful of people attempting to cross the channel in dinghies a ‘Major Incident’. He questioned the need for refugees to seek asylum in the UK when they could have claimed asylum in the first safe country that they encountered, questioned whether they are ‘real’ refugees at all and pledged to do ‘everything we can to thwart asylum claims’. This either demonstrates an astonishing ignorance of the facts surrounding the rights of refugees to seek asylum or it’s a wilful attempt at misinformation. …that’s it, there are no conditions, no such thing as a ‘nearest safe country’ rule – I suspect that it’s deliberate misinformation by those who wish it wasn’t so, but only those that aim to misinform will truly know their motives. A group of refugees huddled for warmth around a fire. 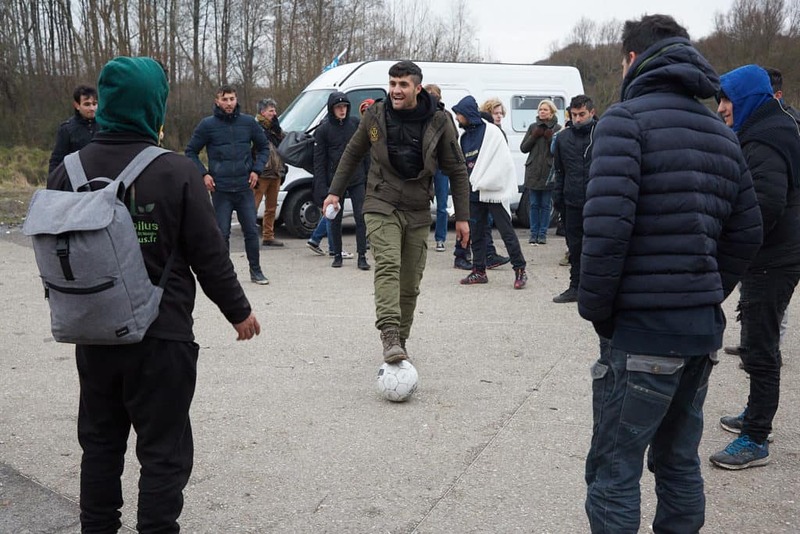 Refugees and volunteers playing football in a circle – I don’t have a single footballing gene in my body but even I can see the value of this game – the fun, the banter, the competitive spirit and the opportunity to show off some skills, it is an absolute joy to watch. I am asked to take smartphone photographs of refugees posing with volunteers on a number of occasions, a couple of young men ask me to take a photo of them standing together – to me, their photo underlines the complete normality and lack of ‘otherness’ of these desperate people. 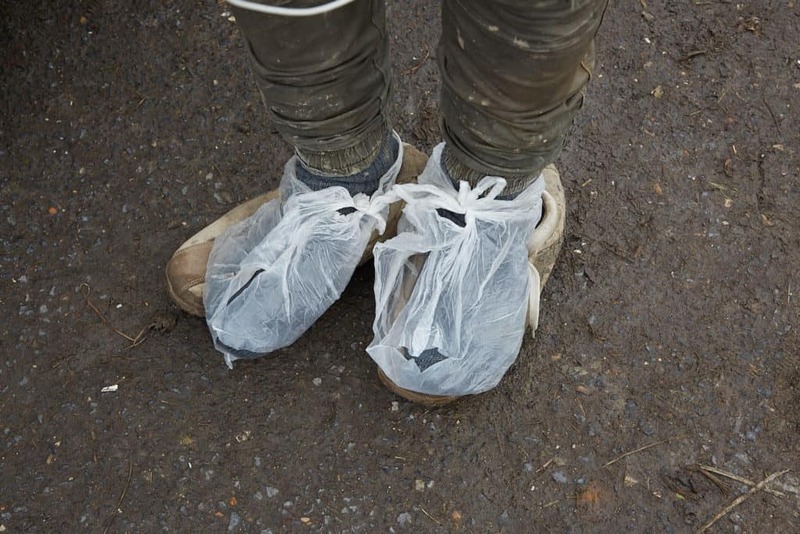 At one point while I am walking around I am stopped by a very distressed looking young man, he asks me if we had any shoes and then shows me his light-weight training shoes – highly unsuitable for the very wet and cold of mid-winter – and he is wearing tatty plastic bags over his socks in an attempt to keep out the worst. I explain that today we are handing out blankets and food, but that he should come back on other days as shoes were sure to be distributed soon. I really felt for him in his state of distress – imagine what it must be like to have permanently cold and wet feet, just how unbearable, let alone unhealthy, that must be. 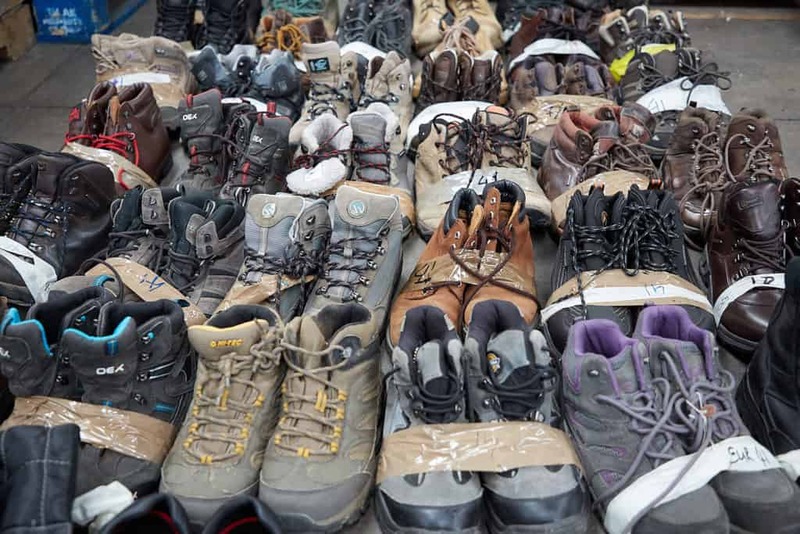 I am very pleased to find that winter boots and shoes are to be distributed in Dunkirk the very next day – and I hope he gets the shoes he so desperately needs. 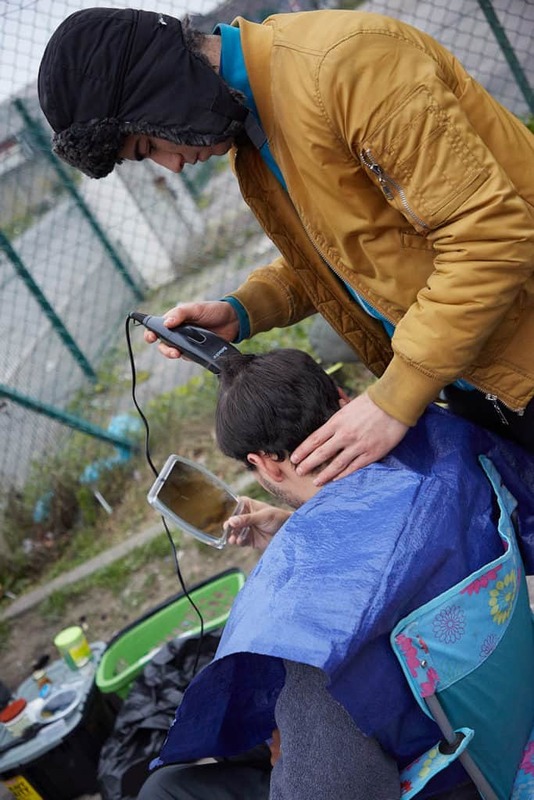 And then there is the haircutting… Introduced only fairly recently as a regular facility provided by Care4Calais, the haircutting is quite extraordinary to see, and in a number of ways. 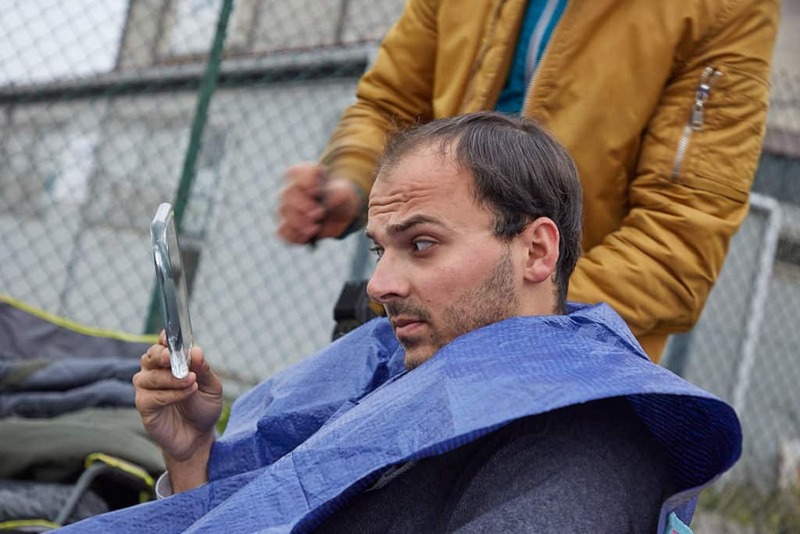 Firstly there is the slightly surreal setup of three or four collapsible camping chairs being used as barber’s chairs in a busy car park, and buzzing hair trimmers connected to a noisy generator. 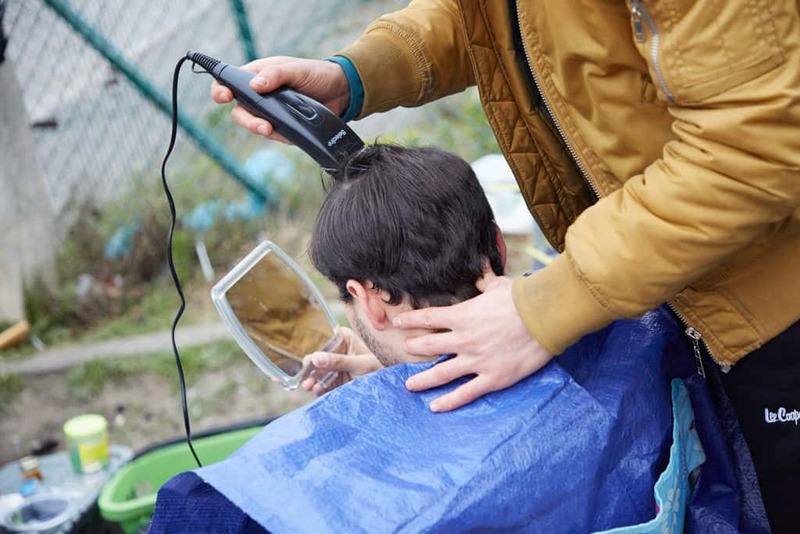 There is noise and energy all around, but in the midst of all of this are people very skilfully and very diligently cutting hair, and not just with the electric trimmers. Real barber skills are on display, involving the precision use of bare razor blades used with and without combs, and the attention to detail is quite astonishing. 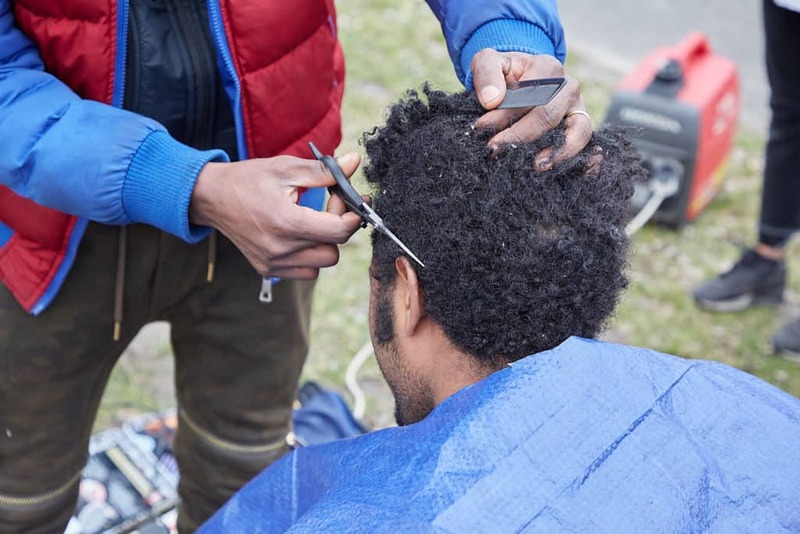 The expressions on the faces of those having their hair cut speaks volumes – they look totally relaxed, enjoying a rare moment of pampering and care, followed by clear pleasure at their new look provided by the barber – a little human dignity restored. The haircutting seems to me to represent so much, and I am determined to capture some photographs. Having failed to gain agreement from people already ‘in the chair’, I get chatting to a guy of about 30 who is waiting in the queue. He’d been a greengrocer in Iraq, his English was excellent, learned not in school I discover, but from watching subtitled movies. It was getting late and I am a little concerned that our chatting has distracted him and that he has subsequently missed his turn for a haircut. I point this out to him but it is immediately apparent that he hasn’t ‘missed’ his chance at all – the older guy now having his hair cut is in the barber’s chair because he is older, he is allowed to go first simply out of respect – respect for his fellow human being in the midst of all of this turmoil. Unfortunately, I miss my chance to get the haircutting photo that I want, but I learn a lot and anyway I know that I had another two afternoons to try again. We drive back to Calais towards an amazing sunset, tidy the warehouse a little and retire for the evening. Saturday, the second day of our visit, and the routine feels immediately familiar. 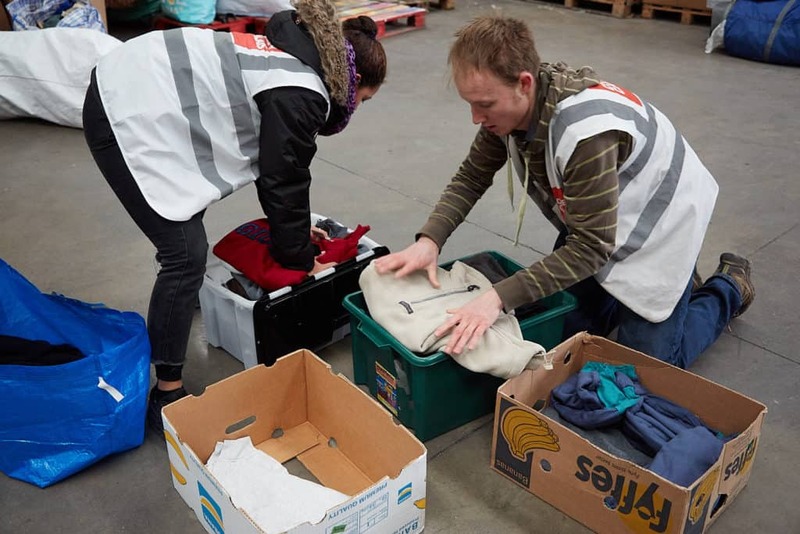 Sorting donated items in the warehouse, lunch followed by the distribution briefing, and then off to today’s distribution of sleeping bags, along with the daily services of phone charging, wi-fi internet, refreshments and hair-cutting. 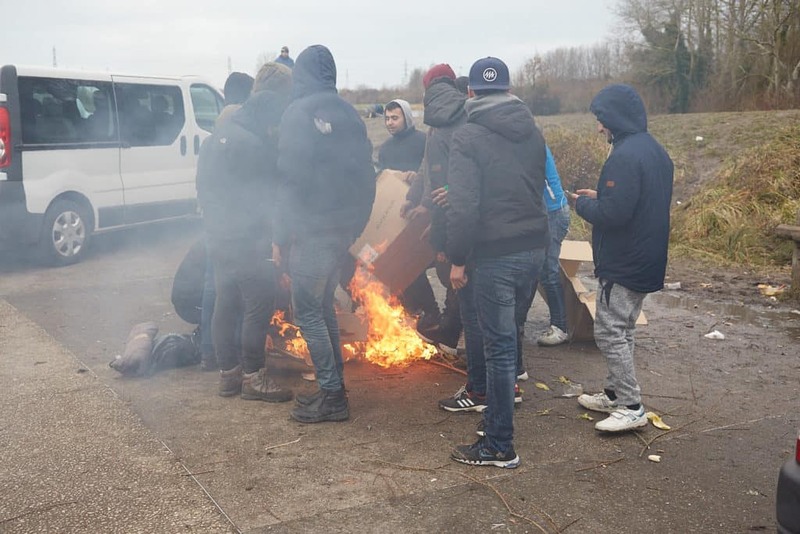 The location for this second distribution is at the edge of an industrial estate in Verottier, a suburb of Calais adjacent to where The Jungle was home to many thousands of refugees until it was cleared and razed to the ground by the French authorities in 2016. When The Jungle was cleared it resulted in the scattering of around 3000 people – those who were not otherwise relocated to different parts of France dispersed into the smaller, disparate groups who now live in temporary locations across the north-west. And temporary locations they are. 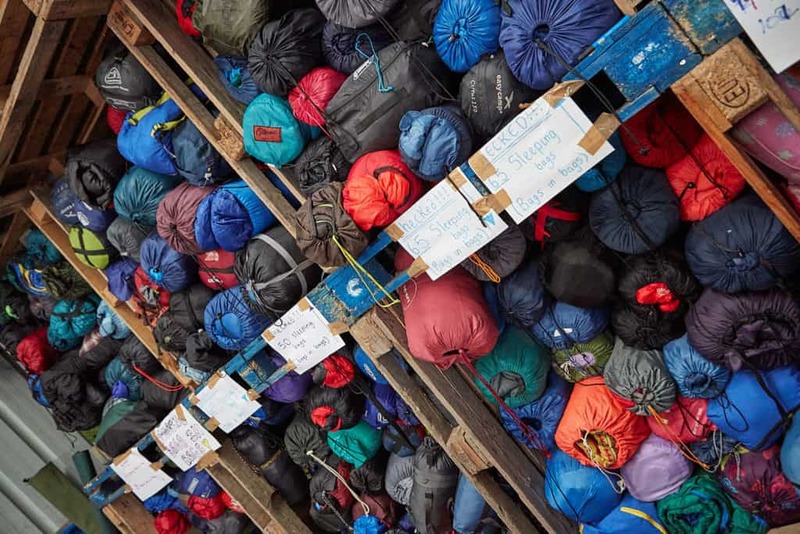 The tactics adopted by the French police seem to be forever more brutal, as highlighted by their regular clearance of any form of temporary shelter, along with the confiscation of tents and sleeping bags – the aim of this inhumane treatment presumably to make the lives of people desperate to get to the UK as absolutely intolerable as possible. I am relieved of my Transit van driving duties to Verottier, instead I enjoy the relative luxury of driving an equally well-used Toyota Aygo. This time I am transporting the tea and coffee facilities, along with a pair of clearly committed university students – sisters who are tasked with managing the haircutting service. The van carrying 60 sleeping bags waits a short distance from the distribution point while the volunteer school students, instantly recognisable in their Care4Calais tabards, approach on foot to set about queue organisation. I see a child of about 6 years-old in their midst – he is wearing a green hooded coat and is clearly enjoying the attention from the students, behaving like any cheeky 6 year-old would and probably should, but the very sight of him makes my heart sink. 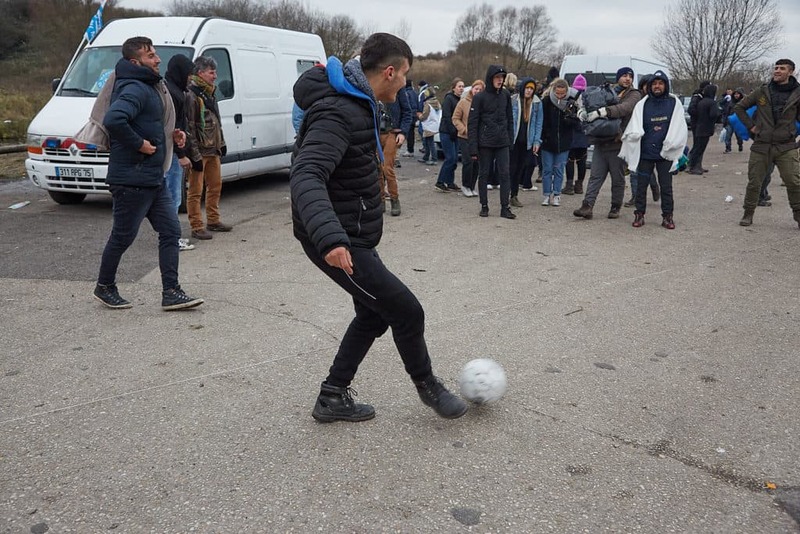 Although I am very aware that there are family groups among the refugees in and around Calais, actually seeing a small child in that situation – with only the faintest idea of the hardship he must have endured and be enduring – is very hard. At least he appears to be having fun at that moment in time. There are far fewer people in Verottier, so the distribution is far less hectic. I help to set up the generators and the wi-fi internet system, answer questions as to which network to select, and get my camera out in the hope of capturing some meaningful photographs. Revealing my camera immediately draws some very suspicious glances, people are clearly more cautious and less at ease at Verottier than they were in Dunkirk. I’m not really surprised. I know from experiences working with people granted asylum in the UK that they can be justifiably very fearful of their faces appearing in the media, as reprisals against family members who remain in their country of origin can be extremely brutal. Understanding this makes me very respectful of their concerns, and although I definitely am not a journalist, my large camera and camera backpack causes concern and photo opportunities prove to be very limited as a result. Next time I visit Calais I’ll travel with a far less conspicuous camera! The people assembled in Verottier – living under canvas on an area of grassland, or in make-shift shelters in woodland on the edge of the industrial estate (until the French police decide to confiscate their tents and shelters again that is) – are from a range of countries generating so many refugees. I speak to people from Iran, Iraq, Eritrea and Darfur and, like at Dunkirk, those who have attended the distribution are all male, ranging in ages from about 16 to probably mid-40s. It’s difficult to guess the age of some of the guys, the strains of living life as they do, having endured unimaginable horrors at home and during their travels, must have an aging effect – but it’s fairly easy to spot the older men by the greying hair, and it’s easy to spot teenagers by the smoothness of their faces. While assisting with mobile phone charging I am approached by one of the greyer haired men, he needs a charger for his phone, he has the cable but no charger. I look around the many chargers already plugged in to the large power distribution board and find that they all have only a single USB connection and they’re all very much in use. Fortunately I have a fully charged USB power pack in my bag which I retrieve and connect to his phone. We chat for quite a while, he’s from Iran and desperate to be reacquainted with his wife and child already living in Manchester. While we are chatting he receives text messages, including photos, from his wife which he is keen to share with me. I ask whether he has tried to reach the UK and like so many others he confirms that he’s tried, and is intent on continuing to try by any other means he can. He confirms, again like so many others who I speak to, that he has been caught by the French police and returned to the Calais outside of the fortress-like protection of the roads, railways and port complex (funded largely by UK tax payers). 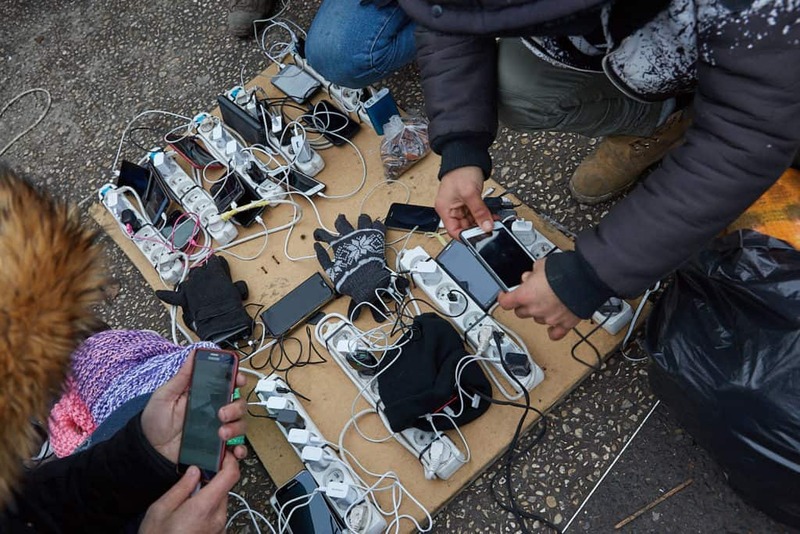 I’ve heard people ask, in person and on social media, how these people can be refugees when they have smartphones – these people are 21st century refugees, many well-educated, fleeing good jobs and previously settled lives, of course they have and need smartphones, they provide a lifeline to family and friends back home and ahead in the UK for those with connections here already. 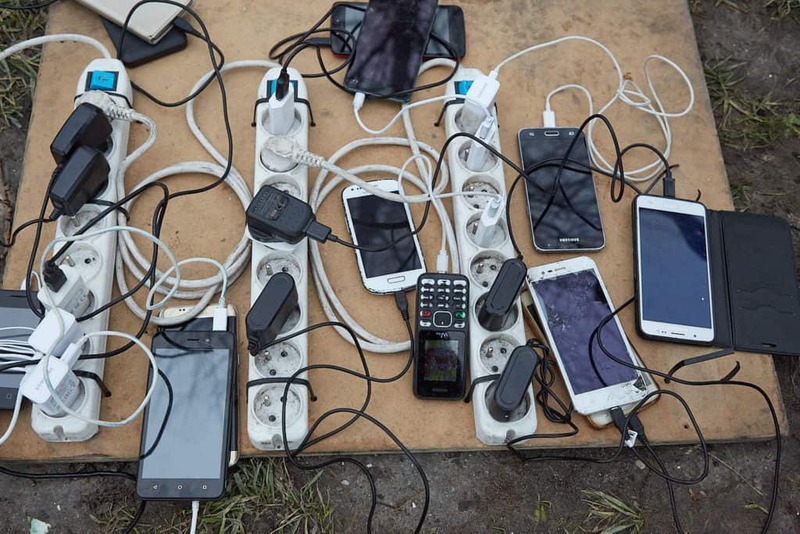 Keeping these essential devices fed with credit and electricity is a major challenge, and the mobile charging and wi-fi internet facilities are every bit as appreciated as they are important. The absolute determination to get to the UK, and the resolve to keep trying until successful, is striking, especially when you consider what these people have been already been through just to get to where they are today. As demonstrated by Sajid Javid’s statements on the subject, it’s clear that there’s a strong will on the part of the UK Government to prevent these particular refugees becoming asylum seekers in the UK. Not so much, it would appear, the tens of thousands of people claiming asylum in the UK who happen to arrive by other means each year! His statement that ‘if you do somehow make it to the UK, we will do everything we can to make sure that you are often not successful…’ (in claiming asylum), suggesting that the Home Office’s asylum process could be made somehow more rigorous than it already is is frankly ridiculous. Ask anyone with first-hand experience of the existing process – they’ll confirm that it is already heavily stacked against those seeking asylum. Statistically, and I’m using approximate figures here but will provide links to more detailed stats at the end of this piece, approximately 50% of all claims for asylum are initially rejected. A further 50% of these rejections are subsequently overturned on appeal – so for those fortunate enough to have access to the funds required to pay for the initial application process, and sufficient to mount a legal challenge against an initially negative decision, the chances of success are actually pretty good, with three out of four applications being successful. 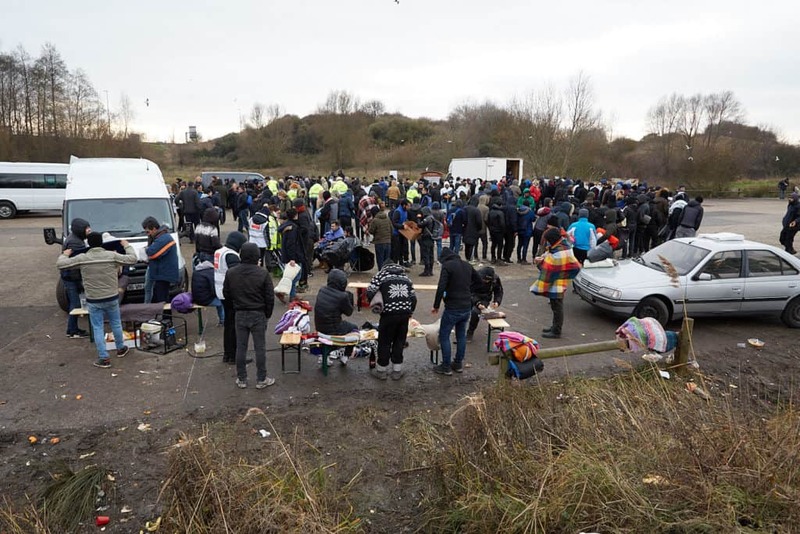 Against the background of these figures, claims that those seeking to get to the UK from France may not be ‘genuine asylum seekers’ are clearly not based on rights, logic or statistics. They are surely about politics – using refugees as pawns in a political game. I’m concerned about how the politicisation of this issue, the way the main stream media seize on and sensationalise it, and people parrot and exaggerate it on social media – the result of which is that it feeds back into wider debate in a very negative and dehumanising way – none of which helps the 3000 or so people, real actual people like you and me, currently living outside in all weather just 21 miles from Dover. Back in Verottier the haircutting proves as popular as ever, although it’s evident that today’s ‘customers’ aren’t benefiting from the same level of skill provided by experienced barbers in Dunkirk! That said, there’s still no lack of commitment to achieving the desired fresh new look and no lack of obvious appreciation, pride and restoration of dignity on the part of those sporting new haircuts and tidy beards. Suspicion about my camera and my motives mean that even haircutting photos are hard to come by, but I manage to convince the last recipient of the day, and his barber, to allow me to take a few photos before the generator was packed away and we left site for the day. Sunday, our third and final day of this trip to Calais, sees our distribution take us to the very accurately described ‘Eritrean Roundabout’. We go with the usual charging, wi-fi internet, haircutting, tea and coffee services plus 60 bags of toiletries to distribute. I get to drive yet another different vehicle, this time an old yellow Transit van that has seen much better days. I may be a little uncharitable about their vehicles, but it’s important to remember that Care4Calais is a charity whose demands massively outstrip their resources and donations. These old vehicles deliver crucial supplies to people at their most needy, and they do that job brilliantly, even if this one is flat out at 45mph! The ‘Eritrean Roundabout’ location is in a side road entrance to a car park off of a massive roundabout that forms part of a motorway junction. The motorway spans the roundabout, is supported by a pair of motorway bridges on either side of it, and there are slip-roads to and from the motorway in every direction. When we arrive in the side road we are alone, which is very different from the crowds of the preceding days. A couple of the long-term volunteers set off to let the local community of refugees know that we are there and before long they appeared in small groups – there are around 25 people in total, all Eritrean men, all wearing crosses displaying their Orthodox Christian faith. We set up our services, all quite familiar on this third occasion, and the distribution team start handing out blue carriers bags containing bodywash, toothpaste, hand sanitiser, etc. Everyone seems quite relaxed, certainly happy to talk, less so to be photographed(!). I get talking to a 27-year-old who explains that he’s been travelling for 7 years, making his way through a long list of north-African countries before making it to Europe and Calais. He is en route to the UK where he dreams of completing his education and starting a new life. I ask him about his excellent English and he tells me he was taught the language at the international school he attended as a child. I apologise for my ignorance and ask him to explain to me why the group around us had fled Eritrea. He explained that the country has been governed by a single party with no elections for the last 27 years. There is compulsory military service for an indeterminate time – 5, 10, even 20 years – for everyone. All school leavers go straight into conscription, those leaving with good grades get to go to college and may escape military roles in favour of civilian ones such as teaching. A little research following my visit reveals that Eritrean’s receive poor pay, have no right to annual leave, and often describe their existence as slave labour – and all in a country that Human Rights Watch identifies as among the worst in the world. Back at the haircutting station I find a now familiar reluctance to be photographed, but manage to encourage a couple of people to allow photos as long as I don’t show their faces. I’m very happy with this compromise and manage to take a few photos that I hope portray something of the incredible level of skill and dedication on behalf of those cutting hair. Once again, the sheer pleasure and restorative effect of a simple haircut is quite incredible to see. We’d been advised during the pre-distribution briefing that we’d have a game called ‘Death Volleyball’ to look forward to at the Eritrean Roundabout. Following some football in a circle as on previous days, the circle got tighter and the person in the middle crouched to the floor, the ball was then kept aloft, volleyball style, around and across the circle of players. Every now and then a player would smash the ball, extremely hard, at the player crouched on the floor – if the ball hits the player the game continues, if it misses the roles are reversed and the new person in the middle awaits the heavy thump of a ball hit hard. I am a little surprised none of the volunteers are playing Death Volleyball and ask one of the long-term volunteers whether we should join in. He warns that two previous volunteers who played had left with broken fingers, such is the ferocity of Death Volleyball, and I decide to be satisfied with my position as a spectator! Distribution over, we pack away, clear litter from the site and leave to return to the warehouse. As we are leaving, driving around the large roundabout beneath the motorway, through and under the huge concrete structures supporting the motorway above, I realised here the community of Eritrean refugees had come from, where they are ‘living’. At the top of the banked concrete supports upon which the road is supported, on a small ledge close to the underside of the road, are the obvious signs of habitation, sleeping bags and bundles of possessions. The incredibly polite, respectful and dignified men that we’ve just met are living in the cold and noisy environment immediately, and I mean immediately, under a motorway. Another shocking realisation during a weekend of truly shocking realisations. Back in Calais we park the vehicles ready for another distribution and say our difficult farewells – difficult because it seems unfair for the support of so many people in such desperate need to fall on the shoulders of so few committed individuals, and all against the toxic debate of the subject being waged by some politicians, elements of the media and individuals on social media. Difficult farewells done, we head back to the UK via the Channel Tunnel, queuing with the many tourists returning from their festive holidays, people quite rightly are going about their lives as they wish, exercising their rights to choose where they live, who they fall in love with, what they do for work, who they choose to, or not to, vote for or worship and where they go on holiday. From the many discussions that I’ve had with the refugees around Calais this weekend, one thing is apparent, all they want is a fresh start, education, employment and a quiet life with the same freedoms that we take for granted. I have some things to do before I go back – please help! 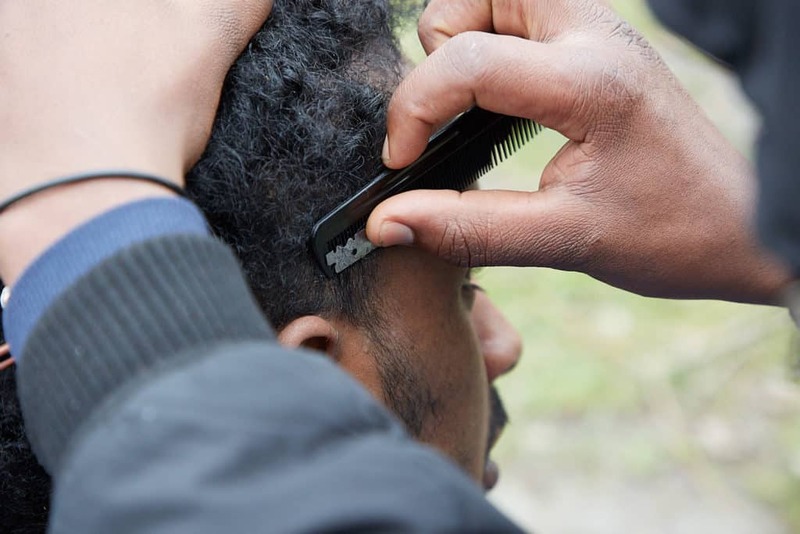 Until such time as a safe and legal route to claim asylum in the UK is created, people will continue to risk their lives to get here by any means that they can. 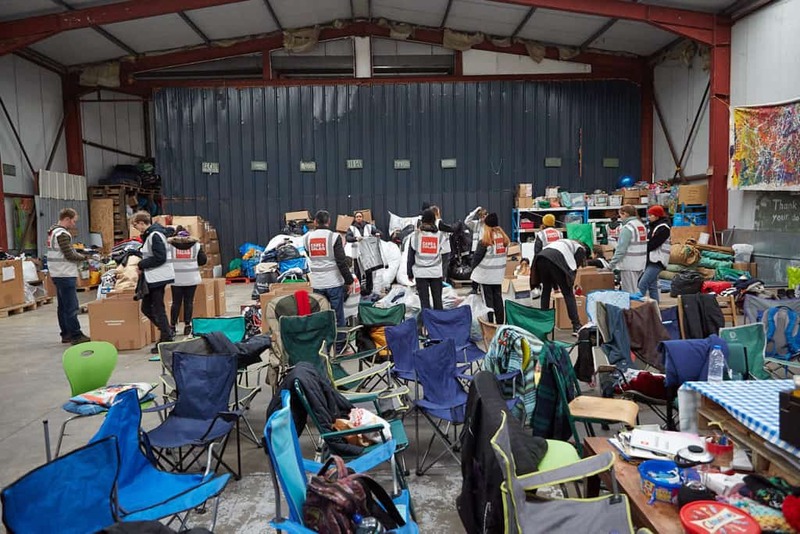 Until that time, northern France is likely to remain a temporary ‘home’ for those wanting to get here, and they’ll continue to benefit from the much-needed help provided by Care4Calais. 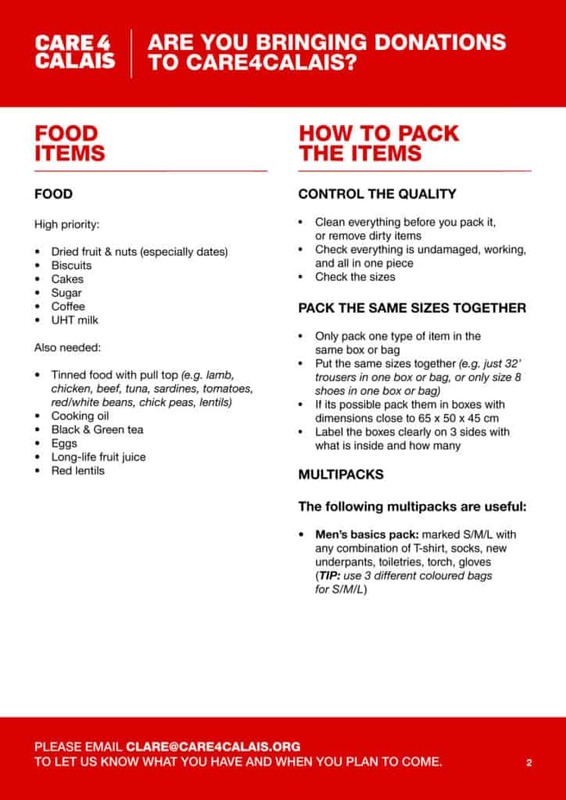 Organise donations of clothing, food, toiletries and camping equipment detailed on Care4Calais’ regularly updated list. Organise fundraising events or donate money yourself. 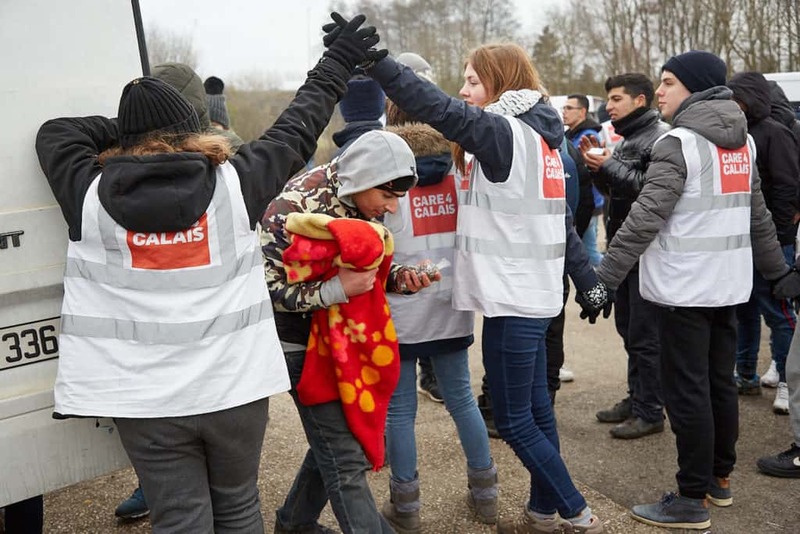 Volunteer with Care4Calais here in the UK – there are a number of opportunities available. 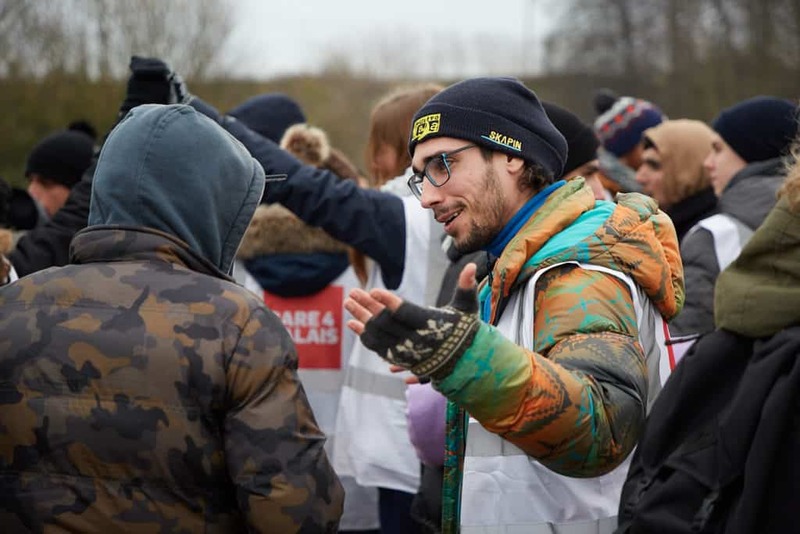 Volunteer with Care4Calais in Calais – see the situation for yourself, meet and talk to refugees in person. I’m glad I volunteered in Calais – it was impossible not to be moved by the plight, the dignity, the respect and the resilience of the people. 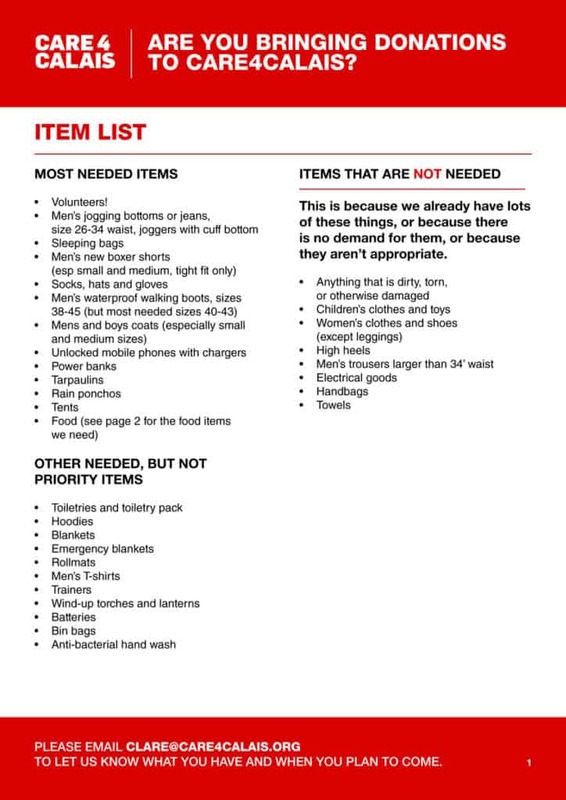 I’ll definitely be going again in the future and am trying to organise much needed donations myself, with that in mind please take a look at the list of most wanted items listed below and get in contact.